KCBW: Where Are They Now? | Stitch, Brinn, Stitch! KCBW: Where Are They Now? They are my only pair of woolen, hand-knit mid-calf high socks. I ADORE THEM. I’m still not crazy about the colors, but they are delightfully warm. Except there was a problem. 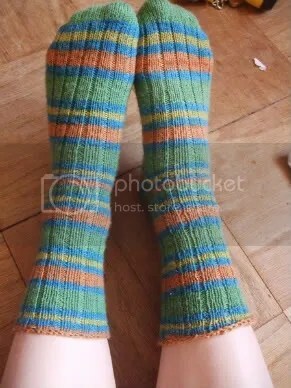 If you recall the original FO post for these socks, I mentioned one of the legs was too small because I accidentally decreased too many after the heel. I wore the socks a few times; I really had to work to get that one on. Where I pulled the leg of the sock over my heel stressed the stitches so much that they popped! This was in December, right at the beginning of winter. I put them in a basket and ignored them for a couple of months. 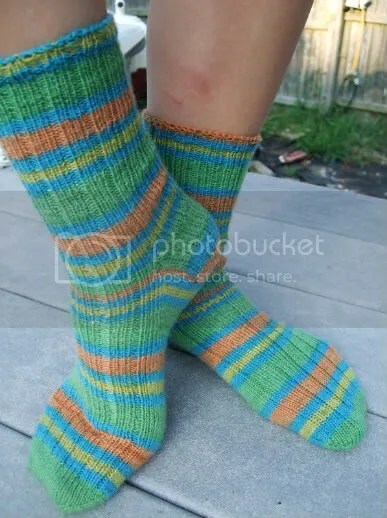 A couple days ago, when the weather was lovely and I was sick of knitting gigantic man socks, I pulled them out and thought, “Y’know, I might like to wear these socks. I think I’ll reknit the leg.” And so I did. They fit much better now and I’m very glad I fixed them. I love this story for the final success! And I like the colors, too. 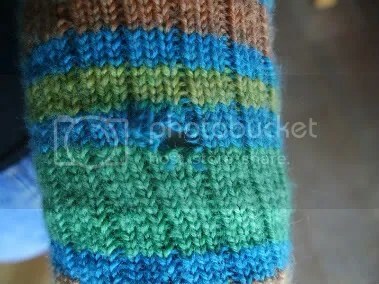 I have a pair of socks with a hole in the heel. The yarn has felted too much for me to be able to reknit them, but I might just have to darn them. I love the colours in those stripes! I love a knitting story with a happy ending! The socks are lovely. Yeah, I thought about just darning it, but the leg was too small anyway and it didn’t take long to reknit. Love that ending … even if they are socks (to which I have an aversion, and I’m not certain why).